Jacking Up the Knowledge for Data In Healthcare – Who Knew that there was so Much Data in the Healthcare Industry? When we think about data, we think about structure, logic, flow – every item relates or connects to another, which lets us find patterns and draw conclusions. In healthcare, data isn’t so well-behaved. In fact, it’s often so varied and complex that we can’t piece it together linearly. Healthcare data resembles an airport. Each item comes from a different source and heads to a different destination, making it difficult to consolidate across the organization. However, just as airlines have systems to aggregate all arrivals and departures, healthcare organizations can use an enterprise data warehouse (EDW) to round up all data into an accessible and manageable system. Modern databases can hold quite a bit of data without slowing down or crashing. As new technologies become standardized, data will come from mobile apps, portable heart monitors, exercise equipment, and other electronic sources, requiring new methods of visualization and analysis. Data comes in different formats – digital scans, video, text, graphs or old yellowed paper from the 1980s. Clinicians rarely have the time to enter data neatly according to the organization’s standard, of which there is often none. This is where data management software shines. As long as the data is digital, users can group related items together and access them with just a few clicks. Many healthcare organizations now require all employees to be trained to use electronic databases and enter data into fields according to a specific format. And while it may be challenging and time-consuming, there’s no substitute for establishing data standards across the organization. 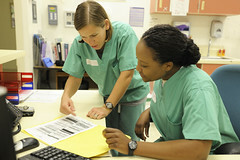 Health Affairs reports that many healthcare organizations struggle with obtaining valuable information to analyze. It’s easy to collect data from various sources without adding important details or thinking about how the data will be helpful. As a result, this data adds nothing but clutter, wasting time and resources. In the worst case scenario, clinicians may use data without knowing its source, and draw inaccurate conclusions that can jeopardize a patient’s well-being. The solution? Each department must determine what, where, and how data is collected and think about how it can be used down the line. Different departments should understand how data is collected across the organization so they can use it accurately. You don’t have to watch an episode of House to understand that clinicians rarely agree on definitions, treatment procedures, and medical protocol in general. This leads to missing or conflicting data, and there’s really no best solution outside of ongoing discussion. New discoveries emerge every day, leading to new medical devices, diagnostic guidelines, treatment options, measurement standards, and thresholds. Manage what data you can, and slowly integrate new information as it gains validity. IT hurdles. This leads to fewer delays and helps ensure that all levels of the organization are more or less on the same page. New data visualization software helps healthcare organizations pluck crucial information from complex data sets and present it in novel ways. In addition to internal data conflicts, healthcare organizations face pressure from various laws and regulations for managing patient data. The Health Insurance Portability and Accountability Act outlines how data must be stored, moved, and used. It can be difficult to balance the organizations’ needs and budget with these requirements, especially as they continue to change. For example, new healthcare reforms may alter how organizations must report readmissions and provide treatment information to the public. Organizations hesitant to adopt a large IT system may face challenges in complying with regulations. However, the effort will pay off in protecting patient privacy, streamlining operations, and avoiding costly legal ramifications. Efforts have been made to improve the standardization of data through the years, and the best of these can greatly improve the quality of incoming data. Some promote the establishment of a data dictionary along with a policy that enforces its use. This eliminates the problem of healthcare professionals using different wordings for the same things. It also smooths out problems like people using different definitions for common fields like race and ethnicity. Another approach tackles the data problem at the tail end of the process. One company promotes the use of what it calls a Late-binding Data Warehouse. This model says that data should be brought into an electronic data warehouse (EDW) in an as-is state. Then, when it’s time to draw information from the aggregated raw data, it is transformed into the exact format that is needed. This prevents problems that arise when regulations or protocols change. No approach to medical data can be called perfect, but both of these models provide benefits. The pre-formatting model is good for situations where big changes are unlikely, while the post-formatting, or late-binding, model is good for institutions where needs are more dynamic. It is, however, clear that healthcare providers do need to have some sort of actual plan in place for data handling. This alone can cut the level of chaos involved and improve the quality and retrievability of medical data.